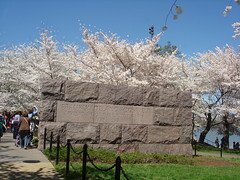 Another Cherry Blossom photo. BTW I have never seen a line to the ladies restroom at this end of this memorial - even on super busy days. One of my quilter girl friends came over for dinner on Friday evening, we had brisket with carrots & potatoes.